In hindsight, I probably should have made this post about a few weeks ago when I first joined.. but yeah. Hindsight is 20/20. 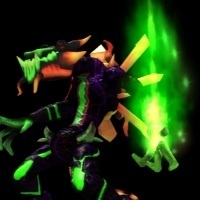 I am Seicho, though on Spore I use my old username of ILHarbinger. I've been creating since the game's initial launch, always searching for ways to make my experience better. I happened across Dark Injection by complete accident after re-installing the game this year, and I've been happily letting my creative juices flow ever since, still trying to figure out ways to get a good adventure made out of it. I plan on hopefully being rather active on these forums, and putting creations up on the Darksporepedia as I make them. if you have suggestions, lets hear 'em. Well, it is hard to make a realistic suggestion because I have absolutely no clue what is possible with Spore and what is not. First thing that comes to mind would be building upon objects usable in the Adventure Creator (Or maybe music from Dark Spore? ), or even so much as the Complexity limits in it.